When asked what rising star Joe Bryan brings to Bristol City's squad, manager Steve Cotterill suggested it is more about brains than brawn. "He's one of the clever ones and wins all the quizzes," laughed the City boss. "He brings a sensibility. He's level-headed. He's one of a kind." Privately-educated Bryan is the son of a heart surgeon and, with nine GCSEs, he could have followed in his father's footsteps. Luckily for City, his fear of blood and love for sport sent him to Ashton Gate. "I wasn't always going to be a footballer," the 21-year-old told BBC Sport. "I just played because I enjoyed it and until then I never thought I could make a career out of it. "I could have gone down the A-level route, gone to university and come out of it not able to find a job. "But when I was 14, I thought: 'I'm going to be a footballer now'." A few years later and Bryan is now the only Bristolian and academy product in City's first team, and he has bagged his first piece of solo silverware - the Football League's Young Player of the Month award for February. The left wing-back has already made 41 appearances for the League One leaders this term and is said to be on the radar of Premier League clubs, including Everton. 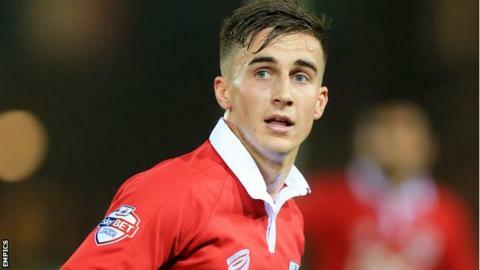 On Sunday, he is likely to play for his boyhood team against Walsall at Wembley in the final of the Johnstone's Paint Trophy - the same competition in which he scored his first professional goal against City's bitter rivals Bristol Rovers in a first-round tie in September 2013. He said of his Bristol roots: "It makes me feel proud. For a long while there's not been many coming through the academy, but if you watch the youth team there's some great players in there. "Whenever I play football I want to do as well as I can, but when it's your hometown club, you know friends and family are going to keep an eye on it." Spotted as an eight-year-old by former kit man Roger Barton, Bryan made his way through the youth team and, like most youngsters, was sent elsewhere for loan spells. In Bryan's case, they were at Bath City and Plymouth Argyle. But unlike fellow academy graduates Bobby Reid and Wes Burns - who remain out on loan with Argyle and Cheltenham respectively - Bryan made the cut for the first team early on. He made his City debut in March 2012 in the Championship but won the hearts of the Ashton Gate faithful just over a year later with his winner in the Bristol derby. But at the time the club were on a downward trajectory. Sean O'Driscoll had not been able to stave off relegation from the second tier and they found themselves at the wrong end of League One, which cost O'Driscoll his job in November 2013. Cotterill has been able to revive City's fortunes - they are now 11 points clear at the top of the table with a cup final to come on Sunday - and has given Bryan the backing he needed to succeed. "At the back of last season the manager challenged me to show him I was good enough and I took that challenge," said Bryan. "He's helped me massively, positionally and defensively. He'll always look for the 1% you can improve on. "Because the team is playing well, it means I can play well. We're all shining at the moment. "It's nice to be involved in a positive environment. We're a really tight-knit group and that's the main thing. We're close on and off the field and we'd run through brick walls for each other." Bryan featured in eight of the nine games Bristol City played in February, and scored his fourth goal of the season against Port Vale, to earn him the Football League accolade. "When he signed his new contract in the summer, he said it was going to be a big year for him," said Cotterill. "He went away, he worked hard over the summer, came back and grabbed it by the scruff of the neck. He's won his place through hard work and dedication. We're delighted for him." Bryan is typically level-headed about receiving the silverware, as he is about the potential interest from Premier League clubs. "A couple of the lads take the mick a bit but there's no point in taking stuff like that," he responded when asked about scouts looking on. "It's always good, isn't it? But the main thing is to be playing well. "The big dream is to play in the top level with Bristol City. So I'll just keep running around and kicking people like I'm told to, and that will come."